There isn’t a detail left out in this thoroughly engrossing read. I was hooked immediately by Anneke’s unusual upbringing and the solid relationships she now seemed to have in her life. There were so many yummy food descriptions and equally yummy house-reno descriptions that for the first time (in ages) I actually read every single word of a book. Though the author does go into detail there was a flow with it that seemed both natural and necessary. I adored Anneke’s quirky habits, loved and hated that crazy dog and every one of the men in her life was warm, intriguing and immediately entrancing. I became attached to them all-even those we weren’t meant to. I wanted to move right on in to the mayhem of construction and feel their energy and their warmth for myself. I was especially pleased with the slow development of Emily and Anneke’s relationship. They obviously both needed something from each other and it added another level to the story that the men could not. It’s always disheartening to come across a heroine who should have had all the support of a loving family and instead was dealt a deck with a lot of missing cards but I think we needed to know about Anneke’s history to really understand how far she came throughout the novel. The choices she made were entirely based on the history of her own life and though we wanted everything to end up rosy sometimes it’s nice when it takes a lot of hard work to get to that point. Though the romantic aspect of this story was slowly paced it was put forth exactly the right way. 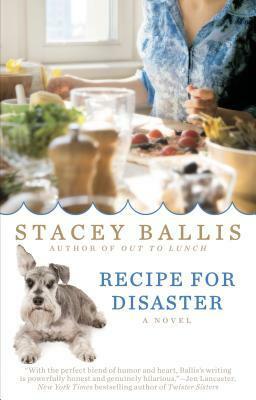 In fact everything about Recipe for Disaster was paced and placed perfectly- there was nothing I would have left out and nothing more I needed from the author to make the picture complete. I loved it. Thank you to Penguin Random House for the review copy. All opinions are our own.